Summary: This article will explain in details that what causes Xbox one stuck on green screen of death and how to fix the problem. There is altogether a different sort of excitement when you get to play your favorite video games with high definition graphics and real-time experience from the comfort of your home. Xbox One is one such video gaming console that gives you an enthralling experience in the world of online gaming. But, what if the Xbox get stuck while loading and displays a green screen of death error? Obviously, at first it will ruin all that excitement and secondly, you may end up losing many games. If this has ever happened to you, and you were unable to fix the issue then, do not worry! There are a couple of steps which could be of great help during such times. All you need to do is to follow the article in order to fix the issue of Xbox one stuck on green screen. Although there is no confirmed reason for Xbox to get stuck on green screen, we have listed below some of the issues that may cause green screen of death to occur. Xbox communicates with the Microsoft’s server each time it starts to check for any updates, and this may cause Xbox one stuck on green screen. Sometimes Xbox does a security check to see if there are any suspicious files. Sometimes there can be HDD read-write error that corrupts the HDD. Communication errors between the servers which causes software to get corrupt. Before you decide to send your Xbox for repair when it gets stuck to the green screen of death, you may want to try any one or all of the below-mentioned solutions to overcome the concern. At the onset, go to support.xbox.com and click on the game you wish to play. Now, click on “System” and select “System Update” tab. After this, go to “How to use the Offline System Update Diagnostic Tool” and scroll down to download “OSUDT2” in the USB drive, this will let you install the update on Xbox One. If in case, you failed to install the “OSUDT2”, then select “Restore Factory Defaults” file. Now, press the Eject + Accessory pairing together, and press the Power key by pressing and hold first two buttons on your Xbox One and wait for repair. When you see “Applying Update” message on a screen, insert a USB drive containing the OSUDT2 update and apply to install. If failed to install, download “Restore Factory Default” file in the USB and connected it to the Xbox console to reset the factory settings. After this, it will ask you, “if you wish to keep the installed games or not”, click on yes. Following the process, you will get over the Xbox one stuck on green screen error. Now you can continue playing your favorite games. If this doesn’t solve the error then follow the next solution. Factory Reset as we all know is a sure shot fix to any software related problems on a device. In the case of Xbox One, it is nothing different. But you have to deal with data loss as it wipes out the entire system. Fortunately, you can keep some games! Press “Hold” and “Eject” button and click on the Power key. Wait until you hear 2 startup beeps, doing this will give you 4 menu options “Restart, Power off, Update off of Flash Drive and Factory reset”. After this, it will prompt a message saying “if you want to keep the installed games”? Select “Yes”, else installed games will be lost”. Click on keep installed games and wait for a while. The Xbox One will start to boot again. Now, all your games will get stored in the game drive and it should work absolutely fine. Here are the steps to do a complete hard reset on Xbox One. To hard reset, you will press and hold the Power button for about 10 seconds. Doing this will let the system restart and fix the error of green screen in most of the cases! But as we said before any type of reset means data loss. And for that, we can help! So, as stated above, after you have fixed the Xbox One stuck on green screen error, you will definitely need a recovery tool with the help of which you can unformat your favorite games on Xbox One. The best program that you can go for is Bitwar Data Recovery Software. 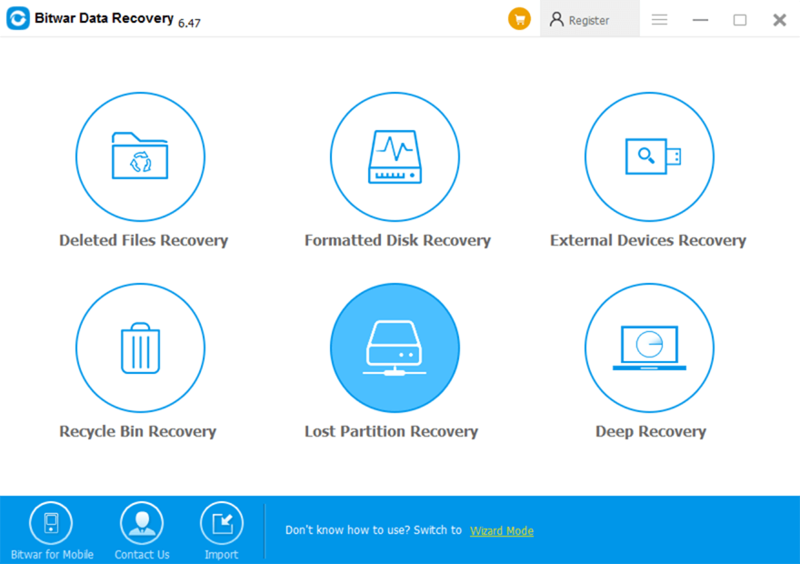 It is free data recovery software that can retrieve any type of data from hard disks, lost partitions, SD cards and much more for Windows or Mac. It is extremely reliable and boasts the highest recovery rate. Download and install Bitwar Data Recovery tool on your PC and launch it. Simply, connect the Xbox One hard disk with the PC. Now, choose the above drive on the Bitwar Data Recovery program. The software will now scan all the deleted games. After the scanning ends, select the games and hit Recover. And that’s it! You will get back all your lost games now. Don’t miss this amazing software! It is always a great way to be sure of what software you are using when dealing with issues related to electronic devices. In Xbox One, there is no doubt that umpteen numbers of software and procedures are there in place to overcome Xbox One stuck on green screen problem, but it’s always better to choose the one that is highly reliable and safe. Follow this detailed user manual to learn smooth and straightforward steps to fix the issue and let the excitement stay! To get back the lost data, go for the Bitwar Data Recovery software. It is quick, result oriented and comes with a user-friendly interface. It is certainly amongst the best ones in the market. Highly recommended! Previous articleNeed to Recover Files Lost by Ctrl+Z? 3 Proven Ways Help You! Can I use the software also to fix the data loss problem on my SD card? Of course, Charles, our data recovery software is helping with the data loss issue not matter on your SD card, external hard disk, USB pen drive, hard disk or Mac hard disk, etc. Thanks for your answer, I will test to recover my SD card today! Many thanks again! You are always welcome, Charles, ask us anything if you need support from us. Have a nice day. Thanks, Charles, have a nice day!